You won't want to miss our new selection of latch hook kits designed specially for kids. 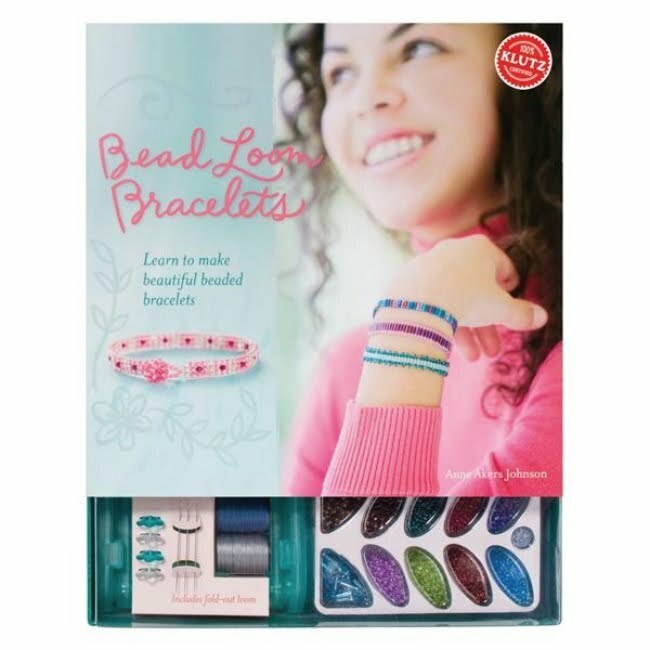 Bright colors, modern designs, and easy instructions make these kits a great choice for kids of all ages to enjoy! You'll find them in the Latch Hook Kits section of the store! 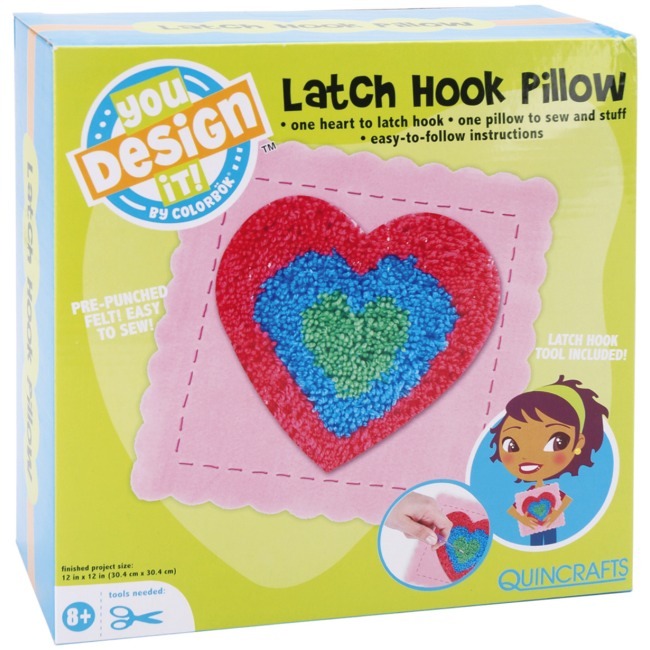 The Heart Latch Hook Pillow Kit from Colorbok includes all the materials kids need to make a soft & fluffy latch hook pillow! 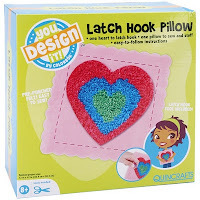 Kit includes a color-coded heart-shaped mesh, pre-cut yarn, latch hook tool, felt pieces, embroidery floss, plastic needle, stuffing, and easy-to-follow instructions. The felt pieces are pre-punched with holes for easy sew-through assembly using the needle & thread supplied with the kit. The only extra tool you need to have on hand to complete the latch hook pillow project is a pair of scissors. Finished pillow size is 12 in x 12 in. The Flower Latch Hook Pillow Kit features a modern floral design and vivid colors. A latch hook tool is included and the latch hook rug yarn is pre-cut, so kids will be ready to start latching right away! This is a fun latch & sew project for kids to do solo or with a friend. Latch hook kits are crafty gifts to give children and grand children. 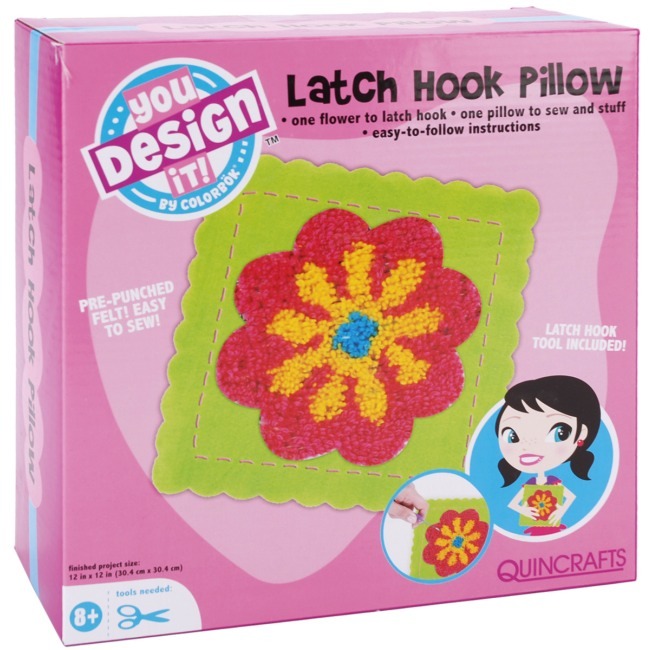 Colorbok latch hook pillow kits are recommended for ages 8 & up. Children love crafting and creating things by hand. Kids will have have fun making these colorful latch hook pillows and using them as bright additions to their bedroom decor! 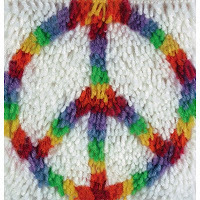 The Peace Latch Hook Kit from Caron includes color-coded canvas, pre-cut rug yarn, chart, and easy instructions. The colorful peace sign is a fun latch hook design for kids & teens. Finished latch hook rug size is 8 in x 8 in. 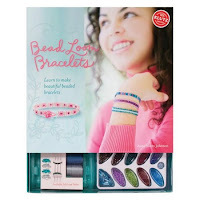 The smaller size makes this an ideal latch hook kit for beginners of all ages! You'll need a latch hook tool for this kit. After completing the latch hook design, latch hook rug binding can be used to cover up the exposed outer edges of the canvas mesh, giving your rug a nice finished appearance. Finished latch hook rugs can be used as decorative wall art or as accent decor for a table or counter top. Visit the Latch Hook Kits section to see our complete selection of latch hook rug kits for kids, teens, & adults. Weekend Kits offers a unique variety of creative project kits for all ages and skill levels. We're continuing to add new craft kits to the store every week, so be sure to check back often and be ready to create something new on your next Weekend at Home!